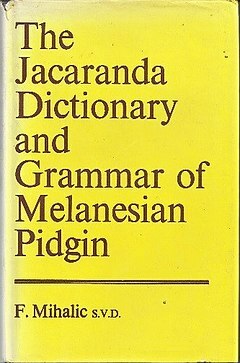 Tok Pisin in Papua New Guinea, Pijin in the Solomon Islands, and Bislama in Vanuatu. AAE terms, or derivative terms, are sometimes used by the broader Australian community. Australian Aboriginal English is spoken amongst indigenous people generally but is especially evident in what are called "discrete communities" i.e. ex-government or mission reserves such as the DOGIT communities in Queensland. Because most Indigenous Australians live in urban and rural areas with strong social interaction across assumed rural and urban and remote divides, many so-called "urban" people also use Aboriginal English. 1.1 Auxiliary verbs 1.2 Pronouns 1.3 "Fellow"
Grammar Auxiliary verbs Aboriginal English does not make use of auxiliary verbs, such as to be and to have, or copulas to link things together. For example, the Aboriginal English equivalent of "We are working" would be "We workin'". Linguists do not regard this as "just dropping words out", but as a fundamental change to the way in which English is constructed. Pronouns Although he and him are masculine pronouns in standard English, in Aboriginal English, particularly in northern Australia, it may also be used for females and inanimate objects. The distinction between he as the nominative form and him as the oblique form is not always observed, and him may be found as the subject of a verb. "Fellow" In some forms of Aboriginal English, fellow (also spelt fella, feller, fullah, fulla, balla etc.) is used in combination with adjectives or numerals, e.g. big fella business = "important business", one-feller girl = "one girl". This can give it an adverbial meaning, e.g. sing out big fella = "call out loudly". It is also used with pronouns to indicate the plural, e.g. me fella = "we" or "us", you fella = "you". Lexicon Kin terms Main article: Australian Aboriginal kinship Words referring to one's relatives are used in different senses to Standard English, reflecting traditional kinship systems. Aunty and uncle are terms of address for older people, to whom the speaker may not be related. Brother and sister—as well as siblings, this term is used to refer to children of one's mother's sister and of one's father's brother (cousin), just as in many indigenous languages. Cousin-brother and cousin-sister are often used to refer to children of one's mother's sister and of one's father's brother. Cousin refers to children of one's father's sister and of one's mother's brother, but may be extended to any relative of one's own generation, such as somebody who might share the same great-grandparent as their own great-grandparent, which is a second-cousin in Aboriginal terms. In south-east Queensland, daughter is used to refer to any woman of one's great-grandparents' generation. This is due to the cyclical nature of traditional kinship systems and mirrors usage in many Australian languages. Father and mother include any relative of one's parents' generation, such as uncles, aunts, their own cousins and in-laws. Grandfather and grandmother can refer to anyone of one's grandparents' generation. Grandfather can also refer to any respected elderly man, to whom the speaker may not be related. Poison refers to a relation whom one is obligated to avoid. See Mother-in-law language. The term second, or little bit in northern Australia, is used with a distant relative who is described using a close kinship term. For example, one's second father or little bit father is a man of one's father's generation not closely related to the speaker. Usually having a second mother is having a woman of your own mother's generation who seems to act like a mother and would most likely care for you if anything were to happen to your own parents. It is contrasted with close, near or true. A skin or skin group are sections which are determined by the skin of a person's parents, and determine who a person is eligible to marry. Son can refer to any male of the next generation, such as nephews, just as daughter can refer to any female of the next generation, including nieces. Glottolog 3.0. Jena, Germany: Max Planck Institute for the Science of Human History. ^ Australian Aboriginal English at the Australian Indigenous Languages Database, Australian Institute of Aboriginal and Torres Strait Islander Studies ^ Butcher, Andrew. 2008. "Linguistic aspects of Australian Aboriginal English," Clinical Linguistics and Phonetics, 22(8):625–642. doi:10.1080/02699200802223535. ^ a b Eades, Diana. "Aboriginal English", Atlas of languages of intercultural communication in the Pacific, Asia, and the Americas. Mouton de Gruyter, 1996, p. 133–141. ^ Eades, Diana. "Aboriginal English". Retrieved 4 June 2011. ^ Harris, John. "Linguistic responses to contact: Pidgins and creoles," The Habitat of Australia's Aboriginal Languages: Past, Present and Future. Mouton de Gruyter, 2007, p. 131–151. ^ "What is Aboriginal English like, and how would you recognise it?". NSW Board of Studies. November 7, 2015. Retrieved November 7, 2015. ^ Wilkes, G.A. A Dictionary of Australian Colloquialisms (Sydney: Fontana/Collins, 1978, p. 167 ^ "Online etymology dictionary". Arthur, J. M. (1996). Aboriginal English. Oxford University Press Australia. Aboriginal English in the courts: a handbook (PDF). Dept. of Justice and Attorney General. 2000. ISBN 0-7242-8071-5.